It's never easy to decide when it comes to choosing themes; even when you have lots of helpful tips in hand. 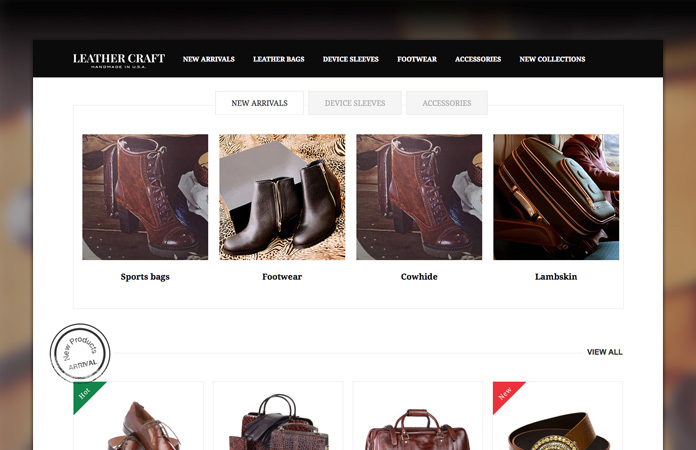 We have worked on to create JM Leathercraft to please those who are in need of a responsive Magento theme for handbags and accessories e-stores. Even if your own an eCommerce site about fashion, leather arts and crafts or décor items, JM Leathercraft can still rock! 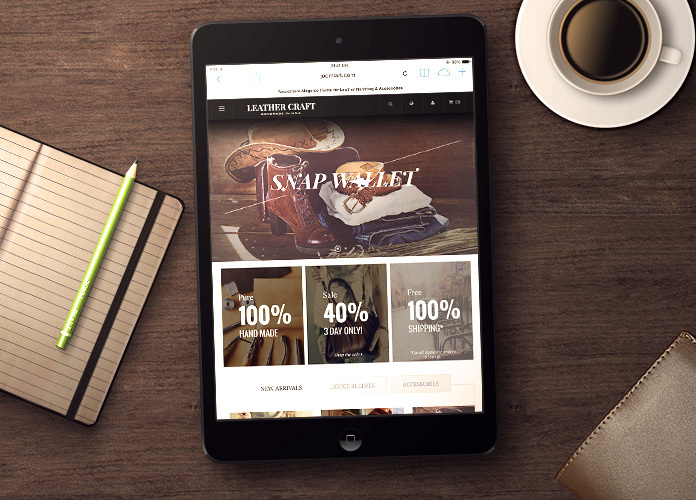 Responsive Magento theme JM Leathercraft charms visually: flat design, grid layout with a good placement of slideshow, sliders, massheads and promotional blocks to display your imagery. In short, you will be able to show off lots of graphics and messages while still highlighting your items right in the spotlight at the same time. Small details that you may love : A handy static block in JM Leathercraft allowing you to quote a sayings or leave a message for your visitors; a catchy space for you to put the testimonials, or links to any blog post or item info. 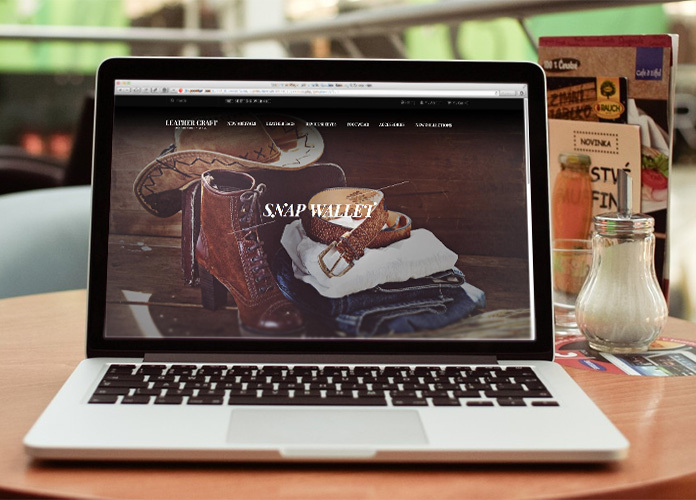 Responsive Magento theme JM Leathercraft has the mission of bringing the most convenient experience for your customers. 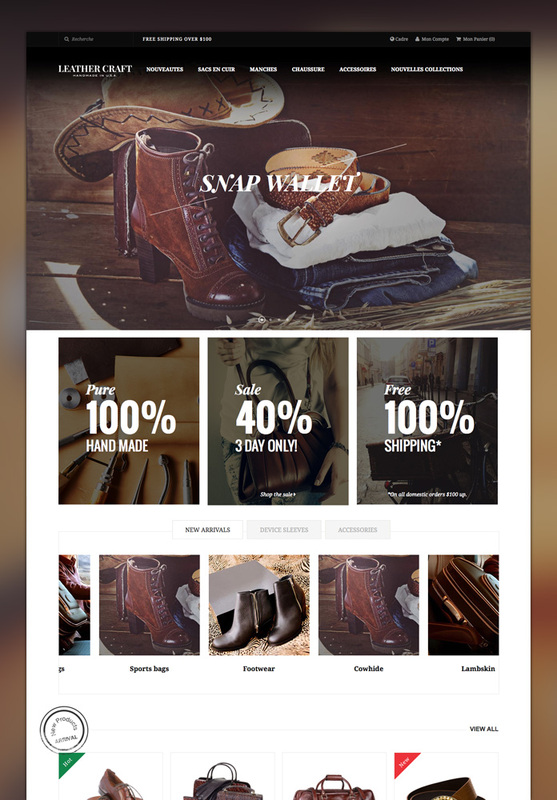 With such a collection of 8 complementary Magento extensions packed-in, this elegant theme surely can do this. Mega Menu is a slick menu solution for presenting contents and stacking space at the same time. With the dropdown categorized menu, you can also add banners, key product info and clips as well. JM Tabs along with JM Product List is much of help to categorize the items into your desired tabs like New Arrivals / Accessories / etc. Located under the slideshow and slider, these tabs can grab your viewers' attention to your key categories. Not to mention this helps to stack the space for Homepage by the way. With JM QuickView, your customers can have the quick access to an actual product detail right from the product list. Once clicked at the thumbnail button, the pop-up window with item info will appear with ease. 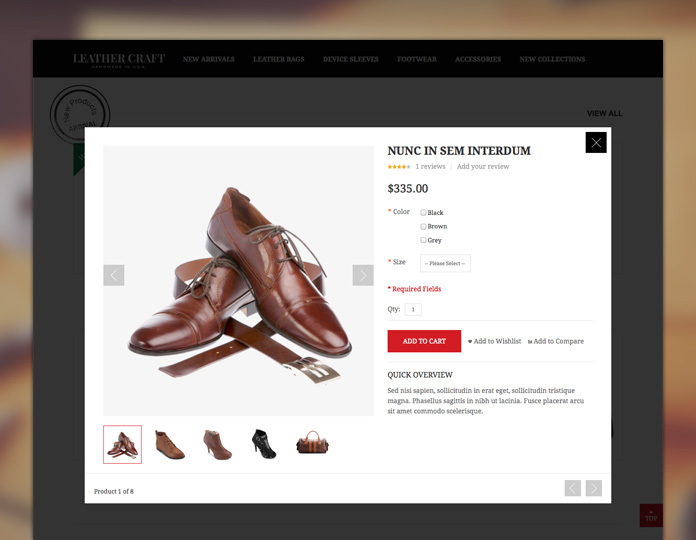 First, responsive Magento theme JM Leathercraft offers 5 default theme skins for you to switch around. 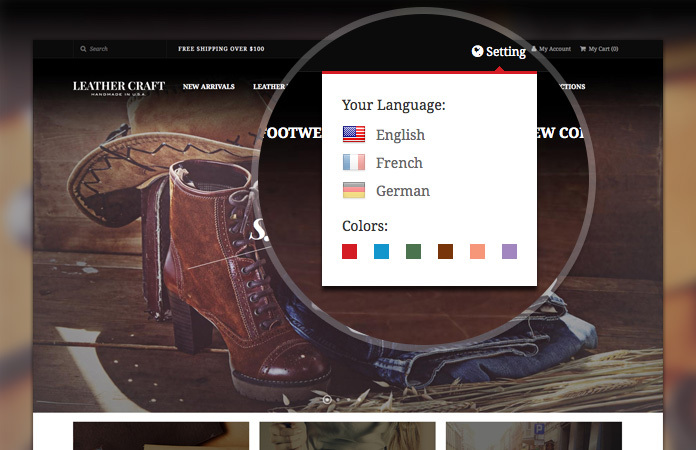 You can access these color alternatives on the top panel of the theme. Second, if you want more options for personalizing, JM Basetheme is ready to rock. 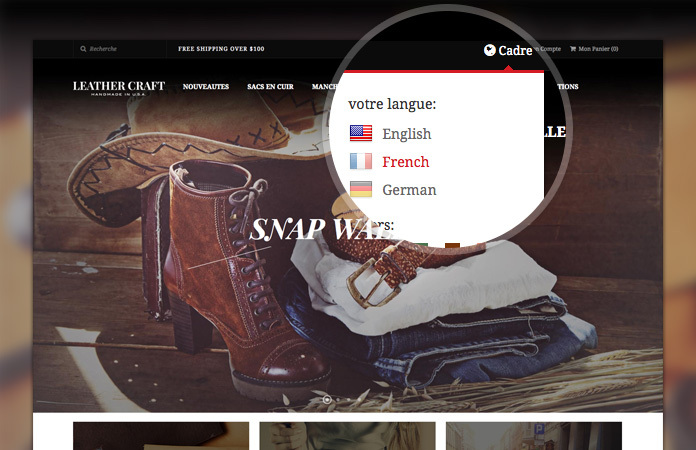 With this Magento theme customizing tool, you will have countless colors to select for background, header and footer. 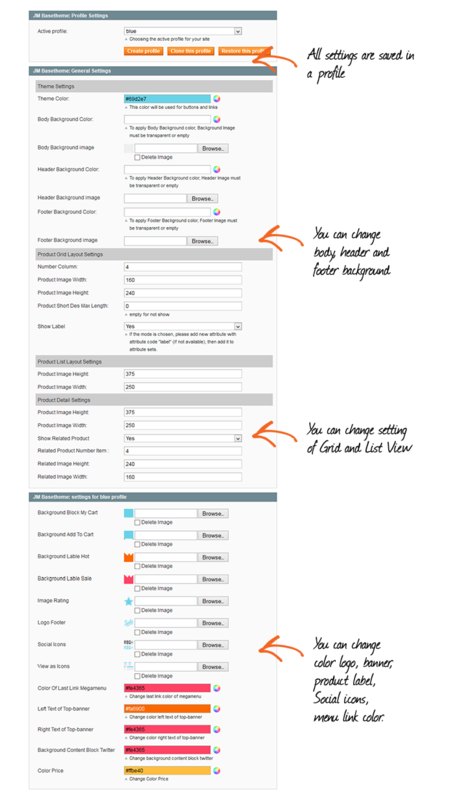 Moreover, you can define layouts for different types of screen, just head over JM Basetheme blog post for more details. Last but not least, also with JM Basetheme, you can add tags for your items to suggest shoppers about which are hot/new/sale on shelves. 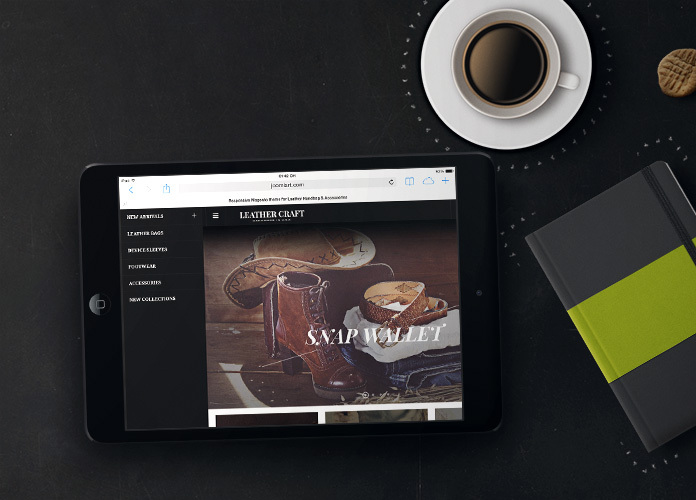 JM Leathercraft is ready to rock on any type of devices from PCs to smartphones and tablets. Not only supporting the responsive layout, the theme also ships with responsive settings for especially the theme customize tool JM Basetheme. This means that you are freely to customize the layout and colors of JM Leathercraft for mobiles and tablets respectively. 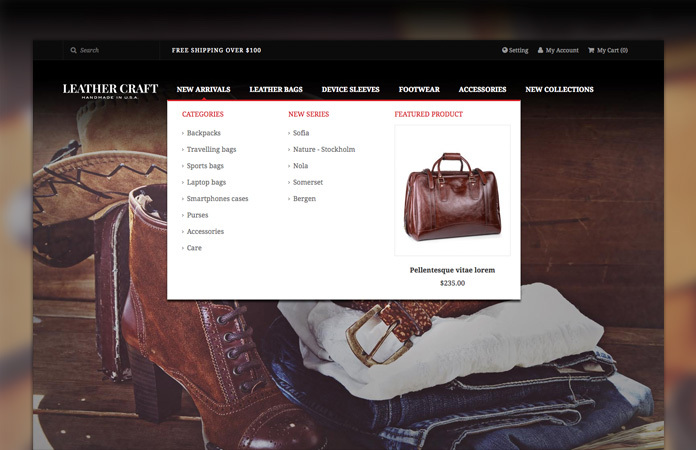 Especially for mobile devices, responsive Magento theme JM Leathercraft features Off-canvas navigation. With this parallel menu bar, your customers can navigate with ease within your site without loading back to the previous pages. 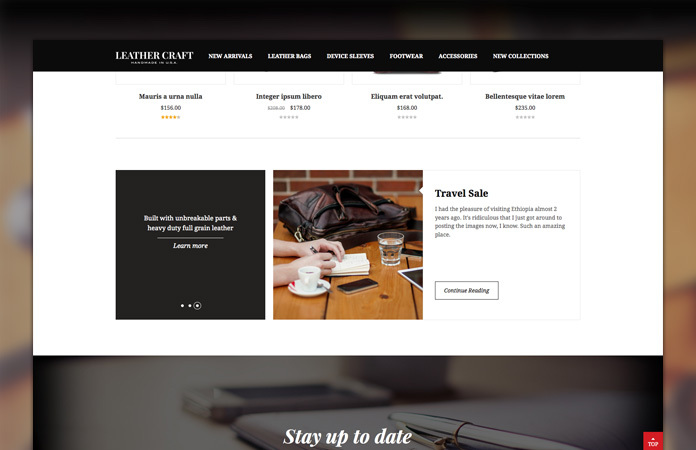 Responsive Magento theme JM Leathercraft supports various languages and currencies for you to reach customers in their own desired preferences. Phew, enough talking now. 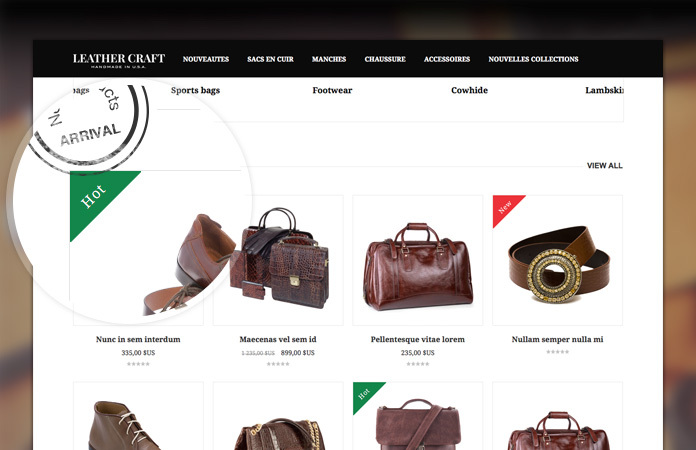 Feel responsive Magento theme JM Leathercraft yourself with the Live Demo site, guess that it is much more convincing and illustrative there! Enjoy JM Leathercraft Demo Grab JM Leathercraft!